Steven (Chicagoland, United States) on 25 July 2017 in Plant & Nature and Portfolio. Photo captured July 8, 2017. Quelle fleur ronde et jaune quels boutons fnatastique compo. Cette fleur n'est pas un souci,mais un oeillet d'inde. The yellow really stands out. Magnificent detail in this image. Superb look at this flower. An impressive blossom. Fine capture of detail and color. Beautiful shot of the beautiful blossom. I love the filtered light in your flower images. It smooths things out so beautifully. This flower is just about perfect! I love the point of view! Gorgeous color and detail! Beautiful colors you've captured in this floral image, - lovely shot! wonderful feel of gold here ! A photo with excellent detail and sharpness. 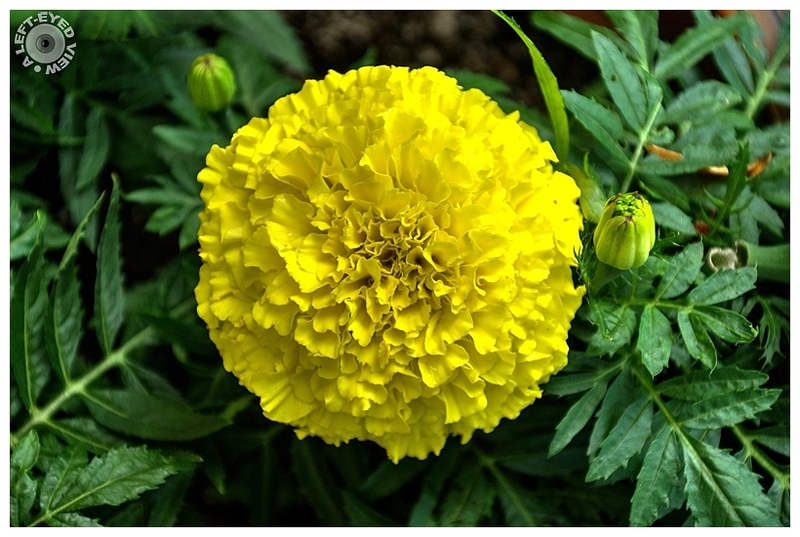 The green background was also allowed to highlight the beauty of the yellow flower. My geraniums are in full bloom now!